IMPORTANT NOTE: At present this mod only works with the ENGLISH Steam version of FF7. Sorry. Also note that this is an early Beta version and may contain some bugs. Please help by testing it, thanks! The 2012 re-release of Final Fantasy VII introduced some great new features: Higher quality videos, fixed script, better music, cloud saves, achievements, etc. It also featured support for the Xbox 360 controller out of the box. 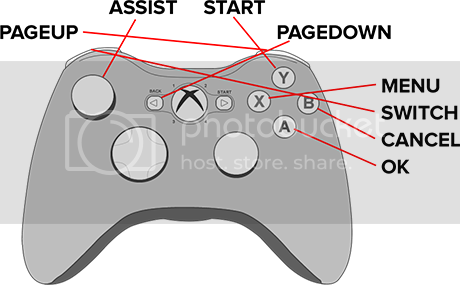 Unfortunately, the way the buttons were mapped for the controller was extremely bizarre. And worse still, it retained the confusing names for each of the buttons. Which button is "ASSIST", "TARGET", "PAGEUP", "SWITCH", etc? There are mini-games where you need to know exactly which button to press at a specific time, and it doesn't help if you don't know what button is being referred to. Is that it? What about the button names? NO! That's not it. Here is where this mod gets special. First an explanation: When FFVII was being converted to the PC, they couldn’t refer to the button names, because they didn’t know what controller you would have. 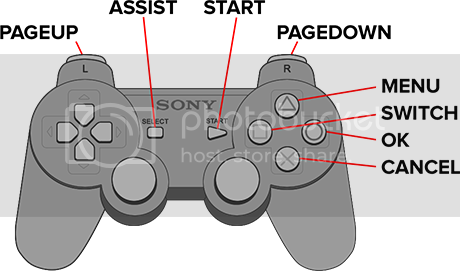 For example, on the original PlayStation, the game would tell you to press the “L1” button on your controller, but on the PC version it would say press “PAGEUP” – leaving you to guess which button that was. This mod changes all references to confusing terms like “SWITCH”, “ASSIST”, “TARGET”, “MENU”, etc. and replaces them with the names of the actual buttons on your Xbox 360 Controller. Every reference throughout the game has been changed, so you never have to get confused about what the game wants you to do! Sounds good. Anything I should be aware of? 1. At present this mod only works with the Steam version of the game. Sorry. 2. If you’ve installed any previous mod that alters the game’s script, this will undo those changes until you uninstall it. 3. The original PlayStation game used the old Japanese button configuration: “X” was CANCEL and “O” was OK – completely backwards to all Western games. If this was preserved, it would mean that “A” would be CANCEL and “B” would be OK. For the sake of everyone’s sanity, I’ve changed these two buttons to their normal Western configuration – “A” is OK and “B” is CANCEL. Will this break my saves, stop me from getting achievements, etc.? 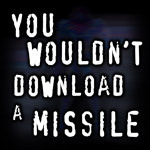 So what if I want to uninstall this mod? Simply go to your Control Panel, click Add/Remove Programs, and double click on “FF7 XBox 360 Controller Fix (Steam)”. This will return your copy of FF7 to how it was before you installed the mod. Why is this 110 MB? That's awful big for what it does. ...changing hundreds of lines of script requires the alteration of large files (i.e. flevel.lgp). I'd love to know how you think it could be made any smaller. Can't you just change the text that the characters for "[MENU]", "[OK]", etc point to? Starting at 0x91AD46 the text "[OK]" can be changed to be something else. The other texts are close by that too. Just change those texts rather than ALL the lines of dialog in the entire game. Hmm... It sounds like you've repacked the whole lgp. Unfortunately, everything you DIDN'T change is still copyrighted data from the original game, and cannot legally be redistributed. My recommendation is to repackage this as a .iro file for 7thHeaven, which will allow you to easily distribute just the changes to the LGP. I meant the exe. The 1998 1.02 exe ought to be the same as the exe in the Steam version. Although, it might not run if the md5 doesn't check out. I'm not sure what to do about that. And, actually, that may just be menu text. It's written in FF7Text so it's actually ";/+=", ";#!.#%,=", etc. I think this is what the game uses to display the buttons names. Yeah, I'm 90% sure that's just the menu text. The ingame scripts (as stored in flevel.lgp) don't seem to make reference to them. In fact, there were a few instances were they referred to non-existent buttons (e.g. [SELECT]). I wish it was a simple as you think it is, but it doesn't look like it. The bottom line is: The mod will remain at 100MB. There doesn't appear to be any other way around it (I even tried looking at diff patches, but they were 10x bigger than the original file). It would be fantastic if anyone who installs the mod could report back with their experience. Thanks! I got a virus warning after the download. Also I don't own the steam version, but the 2012. You can use ToughScript for text editing. Hmm. Thanks for the heads up re: virus warning. No idea why that would be. Since VirusTotal has a 64MB limit and I don't bother with AV software, could you tell me what you're using and what it said. Thanks. If someone would tell me the Registry key for the location of the install, and the location of the launcher cfg files in the MyDocuments folder, for the 2012 version, I will happily extend the functionality of the program to include the SE version. touphScript doesn't work with the 2012/Steam version, btw. Once it does, maybe I could make a smaller install. Your mod isn't important for me, because I use a PS3 controller. For a better visual you could use different colors for the buttons. For Y yellow as example. Thanks. What did it say exactly? There's nothing in the .exe except binary files and .rtf documents -- the mind boggles as to what it's complaining about. As for the colours: It'd be great if I could put images (like the original PS version), but I've no idea how I'd go about doing that. DLPB knows how, ask him. Anyway to keep the file-size down on this you could use a patch rather then replacing the whole file, for example if you used "Vpatch" to patch the old flevel to your new flevel it would cut the file-size down by way more then half (although this method would require the person to have the original Flevel, if they had modified it then it wouldn't work). I should have a ff7-2012 ready touphScript this weekend if everything goes to plan, does anyone know if there are DRM checks on the new exe? Thank you! I've been looking for a decent binary patcher, and I just couldn't find one that didn't generate a patch file that was 600MB+. I just tested vpatch and it created a patch.exe that was only 30MB. And it works! I'll change the next version to this. Thanks again! I believe there's DRM in the SE version, but I'm not sure about the Steam one. Hmm. Here's an interesting thing: A French Steam user installed the Mod, but the language didn't change. I asked him to list the files in data/field and he only had char and flevel. Where's the French version of flevel stored, I wonder? Could I use this knowledge to make the Mod even smaller? The different languages has there own flevel.lgps. (sflevel, fflevel, gflevel). Ah. That would be why my alteration of flevel had no effect on his language. I'm guessing they're stored in an entirely different folder, too. Thanks. The 2012 exe uses securom. The 2013 exe uses Steamworks DRM. Neither checks validity of LGP files, though (and I'm not sure they even check their own validity, just license).